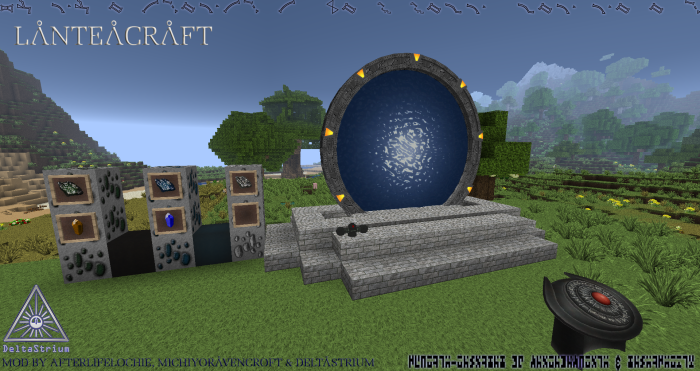 LanteaCraft adds Stargates, and other technology inspired by the Stargate series. Did they stop working on it? How can I use the iris? Hey there, just wondering if a 1.12.2 port is being made for this mod. As a stargate fan, I was really excited to see this, as it seems more accurate to the actual gate than a certain mod that shall not be named, but was disappointed when I saw 1.7.10. I understand though that porting is hard. I was just curious if the port was still being worked on. All i can say is, I hope it goes well. I would very much love for this mod to not die cause IMO its 10,000% better and more in line with the Stargate "canon". Michiyo, you and your team have done a remarkably fantastic job with this rewritten fork and I couldnt be more impressed. Please keep up all the hard work (it certainly has paid off) that you guys have done. If needed to keep this mod alive I would gladly make a $$$ contribution or 2!!! Originální verze mineraftu po nainstalování modu, mod opakovaně vypíná ( neoprávněný zásah do hry ) jaké je možné řešení ? I hope an update for 1.11.2, your mod is awsome ! what happened to the naquadah generators and the zpm's? also how do I attach the iris to the stargate and how do we get to abydos? any plans for a 1.10.2 or 1.11.2 update? Can these gates communicate with the ones from SGcraft? Also, the image on the overview appears to be broken. No, it can not. Also blame curse, it seems they've deleted our image. Is there any chance of a 1.10.2 update ?